Welcome to the National College for High Speed Rail! The future of rail travel is everything you’d expect – incredible speed, technology and innovation. Here at the National College for High Speed Rail is where you can become one of the people who can make this all happen. Whether you’re a new learner or already part of the industry, there are countless opportunities to shape the future of our railways. And our doors are open to everyone. Our state-of-the-art campuses in Birmingham and Doncaster, both with deep roots in the rail industry, have been set up to provide training and work experience to learners aged 18 and above in all aspects of high-speed rail. We’re talking about digital design, communications, project management and leadership as well. We want to create a new generation of employees for the new era of rail travel and modernisation of the existing rail network, drawn from lots of different backgrounds and with the skills to take on any challenge. We’ve partnered with employers from within the rail industry to design a curriculum that’ll give you the skills you need to get a great job and forge an interesting and rewarding career. All our apprenticeships and programmes combine learning at the College with real work experience, so you can put the skills you learn into practice right from the start of your course. 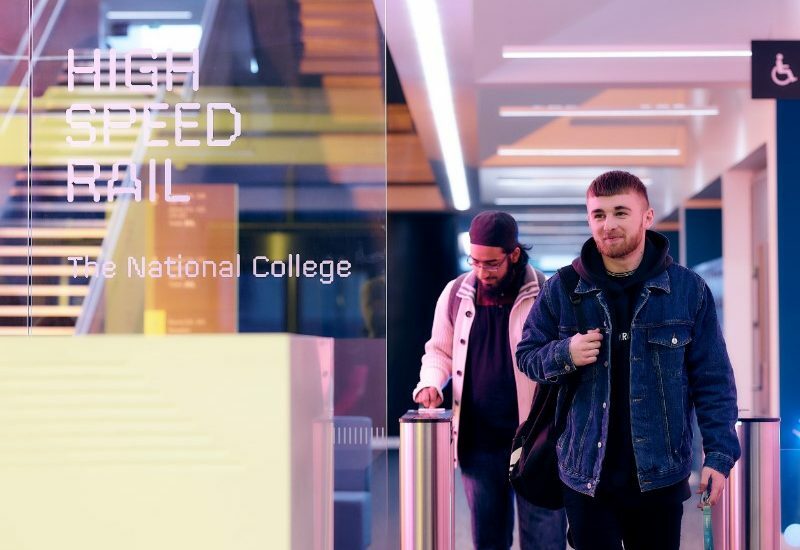 The College is fully kitted out with the very latest equipment – trains, carriages, track and digital systems, to name a few – from companies who are already leading rail into the future. If you’re already part of the industry, we’ll help you keep your skills at the cutting edge with professional training. Everything about our College is designed with you in mind. From the moment you apply for one of our courses, we’ll develop a learning plan that is as unique as you. Our campuses are open and accessible to everyone. Our programmes all start with introductory units to ensure that all our teams of people are working together with a shared understanding of how they fit into the high-speed rail picture. So, we’re not only offering you brand new College buildings in Birmingham and Doncaster; we’re offering dedicated training courses, created by your future employers. We’re offering the chance to meet new people and become part of a new team, and to become a specialist in whatever area of rail takes your fancy. Most of all, we’re offering an exciting path for the future, and experience that will help you define a lifelong career.